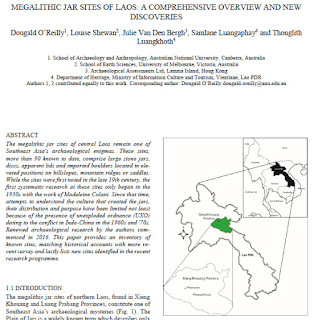 The megalithic jar sites of central Laos remain one of Southeast Asia's archaeological enigmas. These sites, more than 90 known to date, comprise large stone jars, discs, apparent lids and imported boulders located in elevated positions on hillslopes, mountain ridges or saddles. While the sites were first noted in the late 19th century, the first systematic research at these sites only began in the 1930s with the work of Madeleine Colani. Since that time, attempts to understand the culture that created the jars, their distribution and purpose have been limited not least because of the presence of unexploded ordnance (UXO) dating to the conflict in Indo-China in the 1960s and '70s. Renewed archaeological research by the authors commenced in 2016. 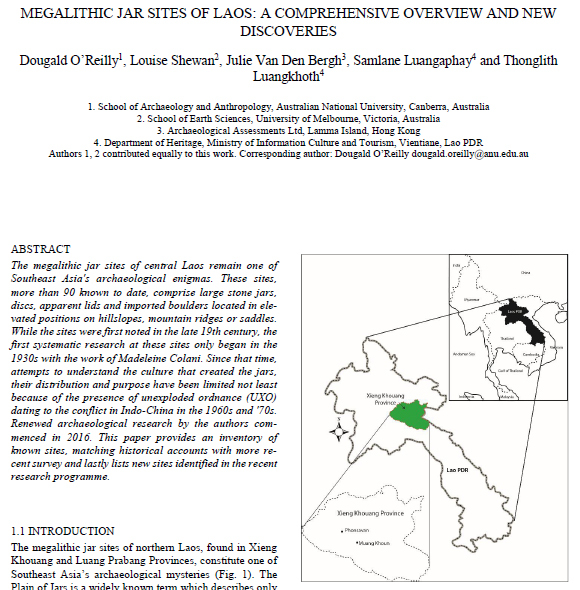 This paper provides an inventory of known sites, matching historical accounts with more recent survey and lastly lists new sites identified in the recent research programme.